This Sunday is the fifteenth anniversary of the horrendous attacks on our country on September 11, 2001. This day is now known as Patriot Day and is a National Day of Service and Remembrance for the victims. Even though much has changed in the world since that day let us not forget all those lost and their families. Now, over the past couple of weeks I have been mulling over a topic that has been making headlines an NFL quarterback has chosen to kneel for the National Anthem instead of standing up and putting his hand on his heart like the rest of his teammates. Why? The man points to what he perceives to be racial injustices within the judicial system. I would like to address in this weeks column simply this: what is freedom of speech, and how does freedom of speech apply to this particular instance? 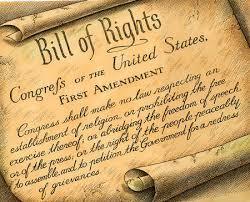 It would be an injustice to speak on freedom of speech without presenting you with the original text; Congress shall make no law respecting an establishment of religion, or prohibiting the free exercise thereof; or abridging the freedom of speech, or of the press; or the right of the people peaceably to assemble, and to petition the Government for a redress of grievances. For the purposes of this column I will boil it down to this: Congress shall make no law abridging the freedom of speech. Abridging, by the way, is a ten dollar word for Shortening or Limiting. So, essentially the first amendment is written to say that Congress cannot limit an individuals right to say as they wish. And I cant think of anyone that would oppose that. So why are some people saying that if you oppose someones actions or speech, then you yourself are stifling that individuals freedom of speech? I can think of only two reasons that people would say this: 1) That person may have a fundamental misunderstanding of the Constitution, or 2) That person is trying to silence your expression by purposely misrepresenting the text of the Constitution. In either case, I would like to delve further. Over the next few paragraphs I wish to make some points that I ask you to consider. If you think Im incorrect, thats fine! Because, guess what? The government shall not make a law abridging your or my right to freedom of speech. First, I would like to point out that the Constitutional right to freedom of speech applies to (and only to) repercussions from the government for your freedom of speech. If you rail against the government in a letter to the newspaper, you will not be punished. That uniquely American concept holds true for all situations involving an individual and the American government. Second, freedom of speech does not mean freedom from responsibility. The Constitution does not provide for a wall of separation between an individuals speech and the repercussions of said speech between private citizens. For example, if I were your employee, and I cursed you to your face and said I quit my job; the Constitution does not provide for my right to show up to work the next day and demand my job back under the guise of my Constitutional right to free speech. So, the government does not and should not become entangled in the affairs of private citizens in regards to speech. Third, because an individual is responsible for his own actions, he must expect to face the consequences. When that same NFL quarterback decided to show up to practice wearing socks that showed pigs wearing police uniforms (Pigs is a derogatory slur for police officers), there was an outcry from much of the country. His freedom of speech is safeguarded by that I mean he isnt in prison for expressing himself but he still can be held accountable for his actions. Who can hold him accountable you might ask? Individual fans that refuse to buy his products; his coach who could see to it that he sits on the bench; or team ownership that could cut him from the roster. Freedom of speech does not preclude him from the repercussions of his actions, so he should be prepared to face any of these consequences. In summation: Freedom of Speech applies only to an individuals relationship with the government, Freedom of Speech does not mean Freedom from Responsibilities, and an individual is and should be held responsible for the consequences of his actions. Drawing from these conclusions we must logically conclude that this NFL quarterback can be held accountable by his team and the public at large. He is free to boycott the police, and you are free to boycott him. No one is taking away anyone elses freedom. Winston Churchill summed up everything I hold to be true on this topic in one sentence Some peoples idea of (free speech) is that they are free to say what they like, but if anyone says anything back, that is an outrage. Ironically, a British politician had a better understanding of the American right to freedom of speech than most American politicians do today. Last, my staff will be holding mobile office hours in three locations this month, and we will be in more locations in the future. On September 13th, we will be at the Market House in Galena from 11:00 to 2:00. On September 14th, staff will be at the Village Hall in Mt. Morris from 11:00 to 2:00. And on September 15th, my staff will be in Winnebago at the Winnebago Public Library from 11:00 to 2:00. Please visit if you have any question on state issues or need any information about state programs.